Some WIPs (works in progress) on a Wednesday: Not all of the students in my Knit 101 class are true novices, but every month or so, a brand new knitter walks through the door. Chris and Justin are the most recent, each with their own motivations for learning a new craft. Ten-year old Chris arrived with his mother, a non-knitter, a few weeks ago and explained he thought knitting looked cool. Yup, you read that right. While he’s got a goal of making a sweater someday, he started with a practice swatch in garter stitch and last week learned the purl stitch. His concentration and quiet pride warm my heart. When Justin walked through the door, I thought he was looking for directions to someplace else! He’s not your typical Saturday morning knit class member: a male, accountant in his late 20s. His motivation for learning to knit? He resolved to learn 10 new things this year. How cool is that?! So far, he’s learned to bake bread and play golf (at an indoor range until the snow melts). When summer comes, he wants to learn how to water ski. His knitting goal is socks for his girlfriend but, like Chris, happily — and very conscientiously — dived into knits and purls. After completing her son’s hat, Louise is working on a scarf (the pattern name escapes me at the moment) in a beautiful variegated yarn. She’s been perusing sweater patterns, so it’s likely she’ll add another project soon. Jacqui recently returned to class after a winter hiatus and has cast on a hat. Before she joins the stitches in the round, I encouraged her to knit an inch or two flat, so that it’ll be easier to join without twisting. The subtle color shifts in this Madeline Tosh yarn are exquisite. I’ve been spending most of my knitting time with the second sock. I’ll get back to the Sunshine Coast one of these days. What’s on your needles? 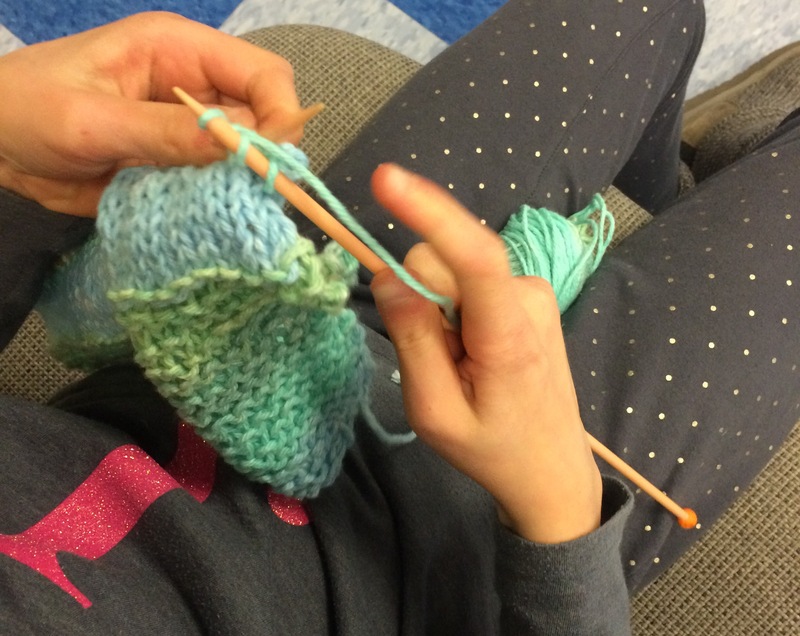 Although already a competent knitter, Jeanne joined the Knitting 101 class at Stitch House a few weeks ago, accompanying friend Jean, a true novice. She’s a terrific cheerleader for Jean, giving her tips and encouragement as she created her first project: a Wham Bam Thank You Lamb neck warmer. Jeanne arrived at last Saturday’s class with one completed mitten and another nearly finished. 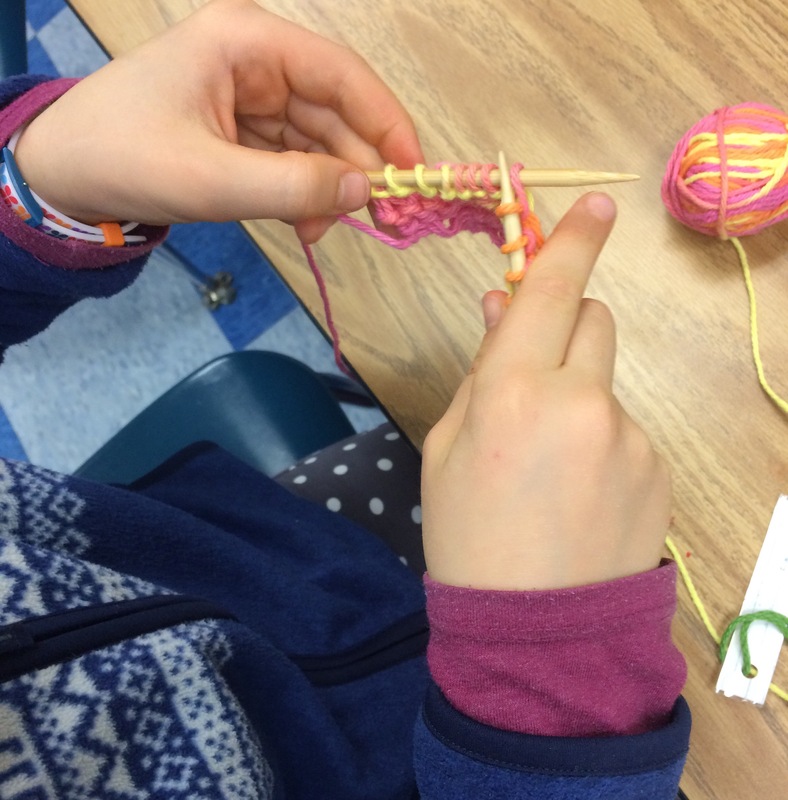 By the end of class, she’d finished the thumb, closed a gap in the wrist ribbing, and was done! Feeling camera-shy, she struck the perfect pose for admiring these simple, beautiful mittens. When she commented that they were a bit roomier than she had hoped, I took the opportunity to share a general knitting tip. Before starting a project, make a copy of your pattern and work from that. Note the yarn and needles you used. Use check marks or your method of choice for keeping track of repeats or numbers of rows. When you’re done, make notes about what you’d do differently next time. In Jeanne’s case, she’ll make the mitten smaller by either using a smaller needle (with same size yarn) or by casting on fewer stitches. I’ve never knit mittens. At least, I don’t think I have. After my recent memory challenge, I can’t be 100% sure. Do you have a favorite mitten pattern? The start of the New Year means the start of a new knitting class. Actually, my classes run on a rolling basis, so students start whenever it fits their schedules. The new year is a time for new adventures, isn’t it? 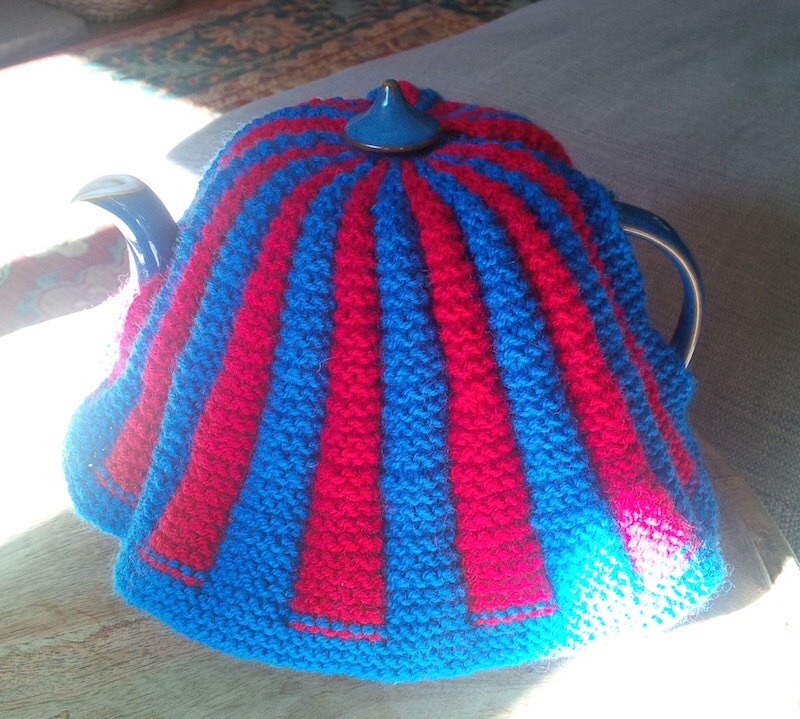 Regular readers will know how much I love to teach knitting since I’ve mentioned it now and again (and again…). 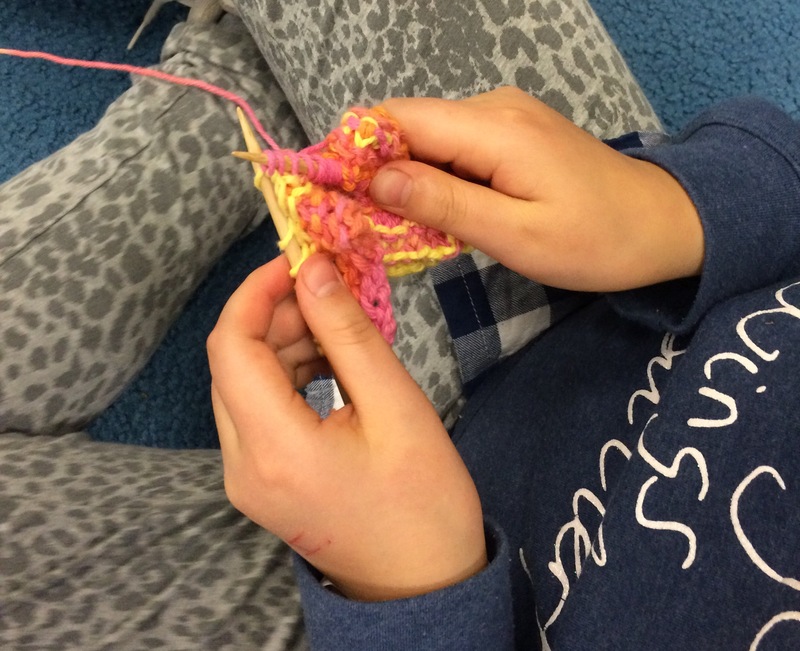 Interested in learning to knit or enhancing your skills and confidence? Read on…. 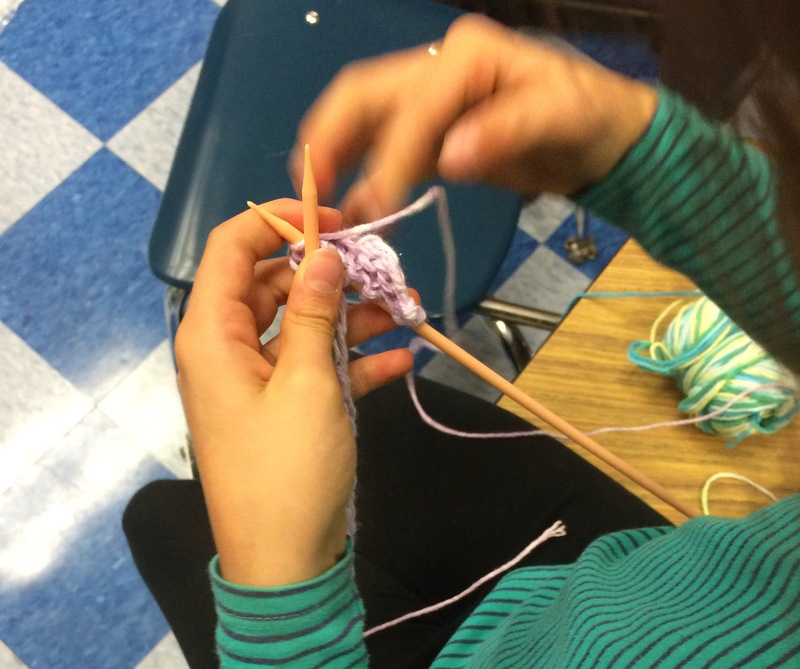 Join one of two knitting classes and attend whichever fits your schedule. Interested? Leave a comment or Email me for details. On a recent evening, Marcia — neighbor, friend, and knitting student (among other talents) — dropped by for a house call. She had a couple of skeins of lovely yarn that needed winding, and she needed a scarf-in-progress that was in need of rescue. Like me, Marcia often visits local yarn stores when she travels, bringing home a souvenir of sorts with which she makes a new creation. This summer, her travels took her to London (England, not Ontario) where she bought a yummy skein of I Knit or Dye’s “At Last” silk 4 ply. It’ll probably be a shawl the next time you see it. She’s also picked up some “Extra” from Blue Sky Fibers (here in Ocean Deep), which will become a soft, cozy sweater. Stay tuned for that, too. Never one to shy away from a knitting challenge, Marcia had modified a cabled scarf pattern by adding an addition “twist” to her latest project. As an accountant, she’s very adept — and particular about — numbers, a very useful skill for a Fearless Knitter especially when it comes to rewriting a pattern. However, while airplane flights are often fabulous knitting opportunities, Marcia discovered that they’re less-than-fabulous is the knitter has taken a muscle relaxant because of back spasms. It was no surprise that she got her cables in a bit of a twist! 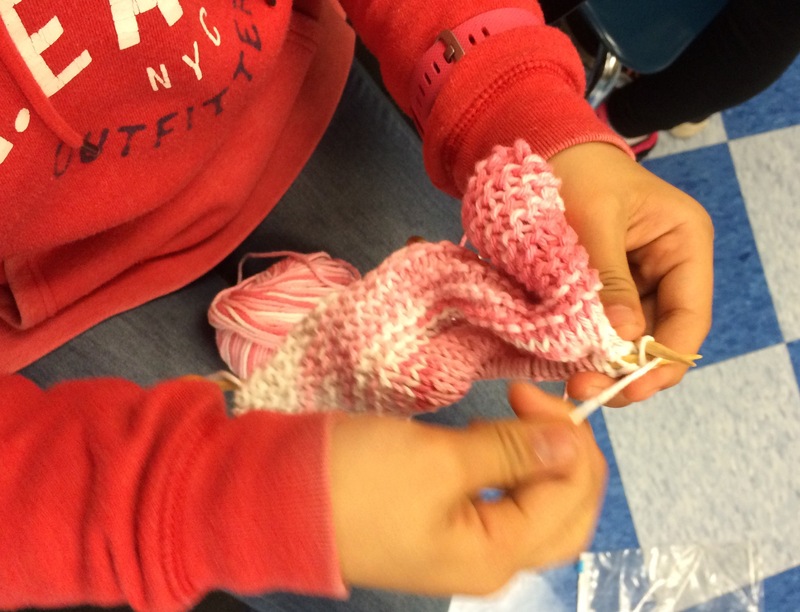 With some careful tinking [to tink (knit spelled backwards) = to unknit, stitch by stitch) and picking up of stitches, we were able to put the scarf back on track. She can’t recall the name of this natural handspun yarn, but I can assure you that it is lusciously soft and squishy.